Always wanted to grow your own vegetables, herbs and flowers but don’t know where to begin? Unsure what to do with your back garden, window box or raised bed? 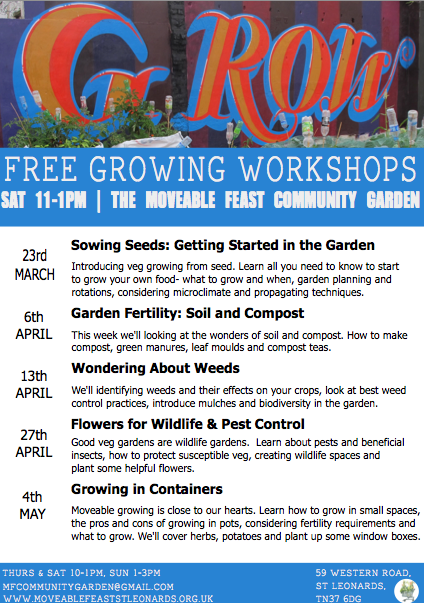 COME to the Moveable Feast Garden’s “Grow Your Own Saturday Workshops” and have your questions answered! These workshops are free to attend and will run on Saturday mornings in March and April from 11am-1pm led by our Horticulturalist in Residence, Abby Nicol. All will combine theory with practical learning in the garden. Refreshments provided. Learn the gardening basics, build upon knowledge, share what you know and have your questions answered. All workshops are free to attend and open to all. I would like to take part in this. Do I need to reserve a place?